Dennis was the founder of the first medical cannabis dispensary in the United States, a leader in the cannabis legalization movement, and he was a friend of mine. Dennis died on January 27th, 2018. The medical marijuana industry in California owes a debt of eternal gratitude to Dennis, who saw the unfairness of making sick people suffer when there was medicine to relieve the suffering. Even if you don’t recognize his name, you and every marijuana user in North America owes him a debt of gratitude. I’m getting ahead of myself so I’ll start at the beginning. Dennis Peron examines some of the plants recently forced to flower in his personal garden, San Francisco, California, 1994. Dennis Peron disembarked in 1969 from a troop carrier arriving in San Francisco from Vietnam. He decided to stay. He found housing, opened his duffel bag and started dealing using the kilo of South East Asian marijuana. He chose San Francisco because of the freedom he found there. At that time, homosexuality was widely discriminated against all over the country; San Francisco had a large gay population that has had a profound effect on attitudes, politics and culture. Within a few years he opened a café, ‘The Island’, downstairs from his marijuana supermarket, located on the second floor. The Island had a cozy atmosphere and marijuana use was policy. In 1973, I signed the contract for my first book, Marijuana Growers Guide, on the premises. Dennis Peron in his personal garden, San Francisco, California, 1994. Harvey Milk started his political career collecting signatures for the initiative. He would continue as a San Francisco Supervisor (City Councilman). Then, he was shot dead by another Supervisor who was a right-wing, anti-gay zealot. In 1993, Dennis’ life partner, Jonathan West, died of AIDS. Dennis experienced the relief that marijuana provided Jonathan as the virus ravaged his body. It helped with the nausea, anorexia and the pain in his joints and nerves. Patients at the medicine counter of The Cannabis Buyers Club founded by; Dennis Peron, Mary Jane Rathbun, AKA ‘Brownie Mary', Dale Geiringer, with Beth Moore, John Entwhistle, Jason Patrick Menard, Gerry Leatherman, Richard Eastman and Dr. Tod H Mikuriva, San Francisco, California, 1994. After seeing how much marijuana had helped his dying lover, he opened the first medical dispensary in the United States, ‘The Cannabis Buyers Club’. It was located on Church Street in the heart of the Castro District, the most ostentatiously gay area of the City. The Cannabis Buyers Club, medicine menu, San Francisco, California, 1994. Dennis knew he was taking a risk but the establishment was an immediate success and within a few months over 5,000 medical patients had joined the club. Dennis was literally considered an angel, providing respite and comfort to the sick and needy. Edibles and tinctures were available at The Cannabis Buyers Club. 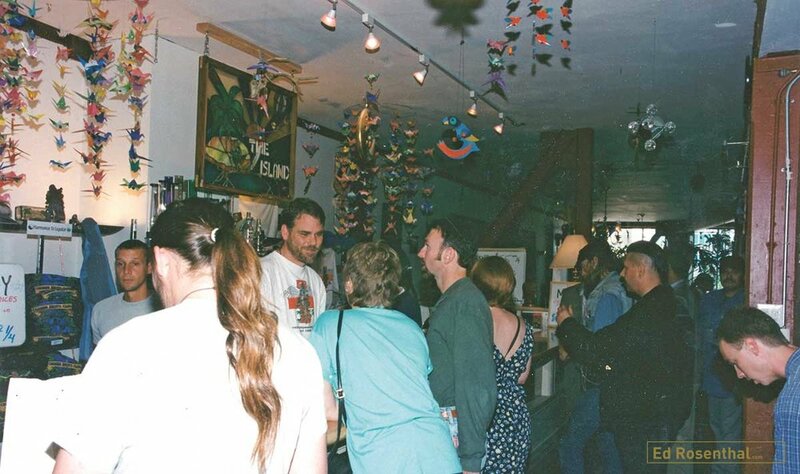 Not only did the Buyers Club provide patients with marijuana, it also served as a community center and as a living room for many of the patients who lived in SROs and lost their jobs and often their friends when they became ill.
Clients socializing at The Cannabis Buyers Club, San Francisco, California, 1994. Tom Ammiano, then on the San Francisco Board of Education, cut the ribbon at the opening of Dennis’ club. Ammiano. He is now a California Assembly Member, and recently introduced a bill to legalize and tax cannabis in the state of California. Tom Ammiano, currently a California Assembly Member, spoke at the opening of‘The Cannabis Buyers Club’; the first medical marijuana dispensary in the United States. In 1996, Dennis co-authored Prop 215, California’s Medical Marijuana Initiative that for the first time allowed patients with doctors’ recommendations to possess and grow marijuana. Dennis Peron believed we all should have the right to grow our own cannabis; Dennis always grew his own. Image of Garden Purple Kush bud from his garden, 1994. The California Attorney General was another ultra-right wing politician. However, the damn had broken: dozens of new medical dispensaries sprung up to serve the patients. Now, there are thousands of dispensaries in California. Dennis never re-opened his dispensary. He was more of a social worker and social innovator and just didn’t have the ambition to be a merchant. He lived in the Castro District of San Francisco in the house he bought decades ago. He converted it to an oasis of greenery; comfort and hospitality. View of San Francisco from the Dennis Peron’s deck, 1994. You would think that Dennis would depend on the largess of medical dispensaries and growers for his medicine, but that isn’t the case. He grew his own. With so many people growing in San Francisco and all over California, clones are readily available. You can buy them at a dispensary and friends and neighbors trade them or give them away. There is a wide selection of varieties available so his garden includes many popular varieties. Dennis’ garden is one of my favorite gardens, even though it was not the most efficient or productive. Dennis’ grow room was used to get plants ready to grow outside. Clones are grown up a bit, and then transplanted to a larger container. The bare light bulb illuminates the entire room, which is filled with plants on the floor and shelves along the walls. Dennis starts his clones in rockwool in a small room to the side of the house. Once they get large enough he transplants them into containers that range in size from about 1-½ gallons to five gallons. He liked to grow in containers that could be moved around so he could manipulate their flowering cycle by moving them into darkness, and also because they were easy to move into sunny areas of the deck. The sun’s angle and thus the sunny areas change with the season and the time of day. Dennis Peron’s plants were mostly in small containers that were easily moved to their indoor shelter each evening. They were placed at different levels so the sunlight is captured. When I visited Dennis is 1994, the plants were basking in the early afternoon sun. One group was on a specially constructed shelf along the deck fence and another group was sitting on a table on a sunny deck. During the day plants come out of the closet to catch the rays and bask on a shelf. Each evening he placed his plants in a small room or in an outdoor shelter covered with plastic to protect against both stray light and the cold night air of San Francisco, which can drop from a daytime temperature in the high 70’s down into the low 50’s or even 40’s at night. The bottom of his containers were cut off so the roots could stretch out into a 14-gallon tray. All the plants were forced to flower when they were small so that they remained under two feet tall and very manageable. The fertilizer and soil brands vary because friends often donate material. Dennis Peron Garden, San Francisco, California, 1994. San Francisco is cool during the summer because the cold air from the sea meets the warm inland air there, creating fog. The winds change around Labor Day so the sun can penetrate. September is the warmest month of the year in the city with warm, clear weather. The cool summer weather delays growth and maturity so varieties take a 20-30% longer to grow and mature here. Dennis Peron’s Purple Kush plant is in later stage of flower. The cool weather does have its advantages. There are few problems with insects. The plants don’t suffer from container burn and their water needs are much lower than plants growing in hot conditions. These mild conditions make it much less likely to suffer environmental damage. At the time, Dennis’ plants were in all stages of growth, from close to harvest to clones growing into young plants, attributable to San Francisco’s mild climate. Throughout the year the daytime temperature rarely dips below 40 degrees and even in winter the temperature can rise into the mid 70’s. Plants can be grown all year round, especially in this situation, where plants get sunlight during the day and protection from the cold air at night. In late September, the plants would start flowering immediately unless they are given supplemental light to break up the long dark period. Then, once they were tall enough they were moved outside to flower under the long regimen of uninterrupted darkness. Dennis’ garden was not only full of healthy plants, it was rich with historical meaning and a small reflection of Dennis’ significance in the fight to end marijuana prohibition.